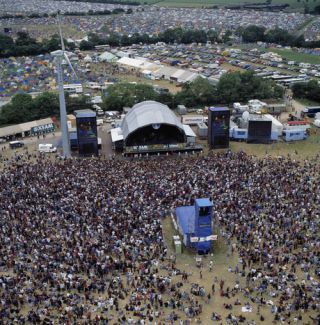 We all know that Glastonbury takes place this weekend. We also all know that tickets for the iconic hippie fest are like gold dust. But, what you may not know is that Glasto isn't the only ticket in town this weekend. Check out our handy run down of five other shows you could catch over the next few days. Not only is Glastonbury not the only show around this weekend, it's not even the only festival kicking off. If you only care about the music rather than the vibe and history, head to Hyde Park for Hard Rock Calling. After all, the headline trio of Pearl Jam, Stevie Wonder and Paul McCartney is pretty hard to argue with. Take a look at Matt Cameron and co in action below. Say what you like about Bon Jovi, but there's no denying that the New Jersey boys know how to put on a show. They continue their residency at the London O2 Arena over the weekend, giving you the perfect chance to catch Tico Torres and co. Leave your brain at the door and enjoy a night full of sugary sweet ballads and the odd feel good rocker (like the guilty pleasure classic below). Oh, make sure you remember your wallet though, as seats start at £45 and go up to a cool £100. After their blistering-yet-undeniably-epic set at the recent Download Festival, we can't wait to see Coheed and Cambria away from the big stages and in a more intimate setting. Luckily for us, they bring their mind-blowing prog sound to the UK this week, with Chris Pennie (a true artist behind the kit) laying down the intricate beats in Newcastle on tonight (Wednesday) and London tomorrow. The perfect antidote to the Glasto blues, as you can see from this stunning clip. The Gaslight Anthem are red hot right now. Hotter than a Vindaloo. Washed down with a nice boiling cuppa. In the sun. New album American Slang is an absolute triumph, and you can catch the guys behind it in Manchester on Thursday or London on Saturday. Glaston who?